This page is included for reference only - note that these items are available at (limited) direct sales events only. The proprietor wishes to inform you that all work is of the highest craftsmanship, and is 100% Canadian made. All items fully guaranteed. A KEY to the illustrations, with PRICES*. God save the Queen and the Maple Leaf forever! Prices quotes for 2000 !! * All prices may vary, depending on the historic accuracy and relative complexity of any individual object. Settlement period ladles and spatula, at Black Creek Pioneer Village. 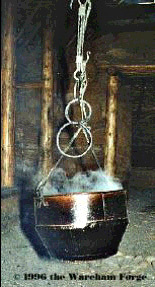 Viking Age cauldron and hanger, at L' Anse aux Meadows NHS. 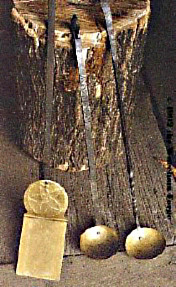 To see more photographs of past reproduction work, take a look in the Gallery. Those interested in the Viking Age will want to take a look at the section on Norse Trade Goods. 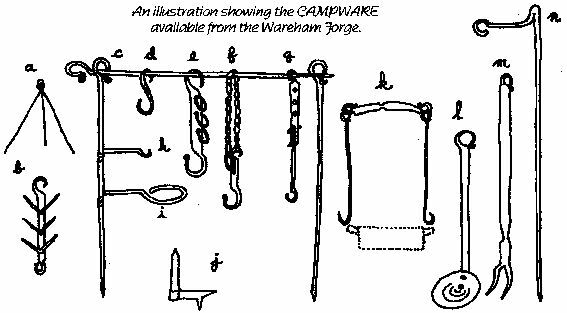 Please contact the Wareham Forge with your requirements and to discuss your specific requirements before placing an order. The items shown above are only the most commonly requested basic pieces. Detailed reproductions of specific artifacts from various historic periods can be produced. Remember that prices will vary based on the complexity of individual design and degree of accuracy required - especially for larger and more elaborate items. The prices listed here are meant to be a guideline only, an apply to 'replica' grade (rather than the more detailed 'reproduction' level). Note that the listed prices do not include shipping or required HST. Please ask for details on the shipping cost for your order - extra charges will apply to large and heavy items.